Dental restoration is the process of rebuilding ones teeth. This includes a single tooth or multiple teeth. The aim for dental restoration is to restore your ability to chew, eat, and talk in comfort, along with your dental health. There are any number of reasons that your teeth may have become damaged over the years. At Shorewood Family Dental Care restorative dentistry in, we have procedures available to fix each and every one! Knowing your options is key to getting the best care possible, So take a look at what we have available! We’ll gladly answer any questions you may have! When you have a tooth that is damaged due to decay or trauma, we make every effort to save it with a filling. However, sometimes there is too much damage to a tooth to simply patch a hole. In this case, we use a crown to protect a damaged tooth from further harm. With a crown, we also restore your ability to use that tooth without pain. We use a bridge to replace a missing tooth. It consists of a false tooth connecting to two crowns, which sit on the teeth on either side of the missing one. Both crowns and bridges are porcelain reconstructions built in a lab from an impression of your mouth. Crowns (and the crowned teeth on the sides of your bridge) are reduced in size to fit under the crown. We use our ITERO machine to build a 3-D model of your mouth. The lab then uses this model to build your crown which enables us to make the most precise models possible! Implants are the newest and most amazing advancement in restorative dentistry. When you’ve lost a tooth, the traditional method of replacement is with a bridge. However, a dental implant is a superior option! A dental implant is made of a titanium screw that is placed at the root of your missing tooth. 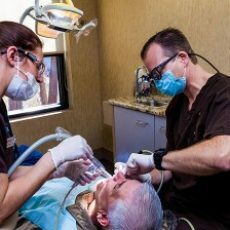 With this unique procedure, a dental implant acts just like your real tooth! The bone-bonding properties of a dental implant allow it to stay safe and secure. This protects you from bone loss that happens following the loss of a tooth. We put a crown on top of your implant, and it acts just like a real tooth! Whether you need a new set or are unhappy with your current dentures, we feature several different options. We can build traditional dentures for new patients, as well as implant-supported dentures for additional comfort and security! implant retained dentures feature a series of implants that are topped with a bar or series of metal balls. Your dentures – either new ones we make or your current set – are modified to hold clasps or sockets. When you put your dentures in, they’ll be held securely in place without the need for pastes! You can confidently smile, laugh, talk, and eat knowing that they aren’t going anywhere until you chose to take them out! When you have multiple kinds of damage or tooth loss to contend with, getting your smile and ability to eat without pain and embarrassment can seem a far way away. We are proud to offer full-mouth reconstruction sequences to get you all the care you need! Working with your dentist, you can plan reconstructive procedures every step of the way and get exactly the smile you want! Over a series of months, you’ll get each and every bit of help you need to smile comfortably and eat the foods you love! If you are in need of restorative dentistry in Shorewood, IL, don’t wait for treatment. You deserve to eat your favorite foods and smile with confidence! Call our office today at (815) 725-5991 to discuss your options. You can also schedule an appointment using our online form. We hope to start you on the path to a great smile soon with our restorative dentistry!